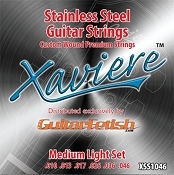 Our Stainless Steel set gives you extra high end clarity, enhanced output volume and really amazing extended string life. If you're killing nickel wound strings in a week or less these are for you. Also great to give humbucker guitars some extra zing.